Just this last week, Dr. Cerrato received a NSF CAREER Award grant for his project, "Understanding Reactivity in American Native Impacted Uranium Mines (URANIUM): Research, Education and Outreach". CAREER is the National Science Foundation's most prestigious award in support of early-career faculty who have the potential to serve as academic role models in research and education and to lead advances in the mission of their department or organization. His project for this grant will build on relationships developed as an EPSCoR team co-lead for the Uranium team, and will focus on identifying "governing biogeochemical mechanisms affecting the contamination and remediation of metals in organic-rich sediments in abandoned uranium (U) mine wastes in northwest and central New Mexico." José and his team will investigate the different forms of uranium present (speciation) and its accumulation in sediments. The award also includes an Education & Outreach component that includes partnering with the New Mexico Museum of Natural History and Science to disseminate findings, as well as developing a training program to empower Native American students to pursue environmental science & engineering. For more information, visit the NSF website for this award. But this isn't the first time José has received prestigious recognition. 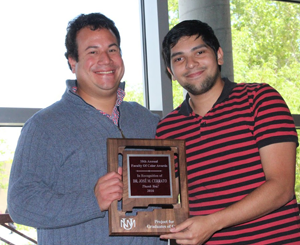 Back in April of 2016, José received the 2016 Faculty of Color Award in the "Research Category" from the Project of New Mexico Graduates of Color (PNMGC). Nominated by his PhD student Nabil Shaikh, the award "recognizes an individual who engages in research that is significant to communities of color, uses community-based practices, critical methodologies or theories, or who promotes co-research with students (source)." José hits all these marks—indeed, his work with the Navajo Nation and Laguna Pueblo on Uranium contamination and mitigation for the Energize New Mexico grant alone will impact these communities for generations to come. In July, Dr. Cerrato's research was featured in a special issue of the journal of the Royal Society of Chemistry (RSC), Environmental Science: Processes & Impacts. The special issue, "Emerging Investigators 2016" is the fourth edition of Emerging Investgators, an initiative by the ES:P&I journal to support and celebrate "the best and brightest among early career scientists around the world." The paper, entitled "Wildfires and water chemistry: effect of metals associated with wood ash", features Dr. Cerrato as the lead author and was co-authored in collaboration with NM EPSCoR undergraduate students Chris Hirani and Alexander Clark, and Drs. Johanna Blake, Abdul-Mehdi Ali, and Rebecca Bixby from NM EPSCoR, as well as two other non-EPSCoR co-authors, Kateryna Artyushkova and Eric Peterson. You can read the abstract of the paper, or visit the Emerging Investigators 2016 issue for more information. Congrats, José! Your awards are well deserved, and we're happy to have you as part of the New Mexico EPSCoR team.